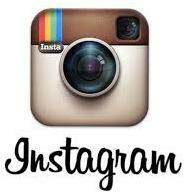 Feedback: 21 comments - leave yours! Muslims, Jews and Christians all agree that the parents of humanity, Adam and Eve, lost their place in the Garden of Eden after Eve was tempted by a snake into eating the forbidden fruit from the Tree of the Knowledge of Good and Evil. When they were cast out of heaven, little did they know of the many culinary delights to come on this earth. 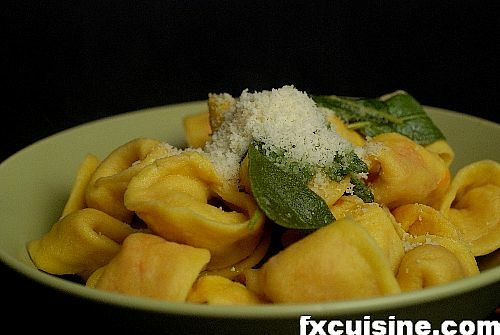 How can a apple compare to a plate of tortellini? If we all are locked out of heaven for an apple somebody ate thousand of years ago, I say let's make this earth our own heaven. With a little work there is no limit to the amazing things you can make with what you find under the sun. 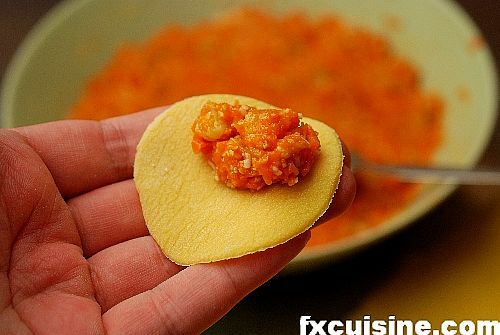 These are pumpkin raviolis in the tradition of Cremona, city of Stradivarius and of many sweet-and-savory dishes. 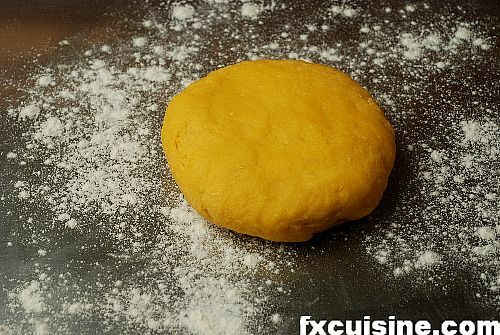 First we make the filling because it can wait while the pasta dough cannot. 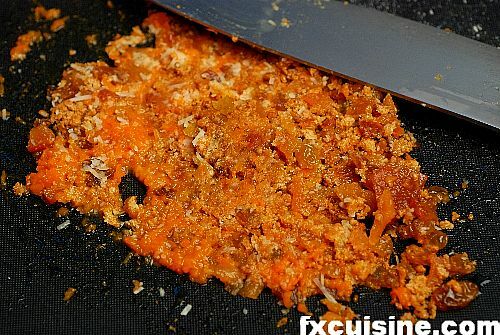 Roast a pumpkin in the oven, peel and scrape 1kg of flesh. 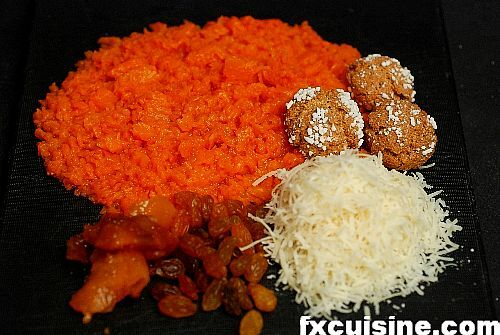 Add 100gr crushed amaretti, 100gr grated Parmesan, 100gr raisins and 100gr mostarda, a sort of Northern Italian pickle you can buy in little jars. Season with a little grated nutmeg. Chop everything together. Do not use a mixer, you want to keep some texture. 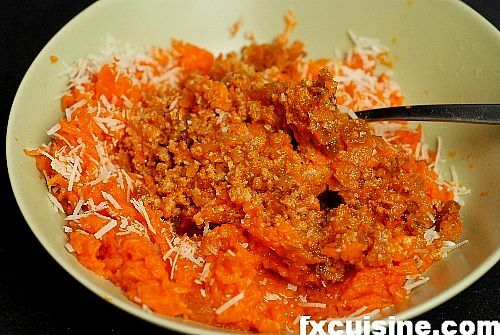 Cover and leave in the fridge until ready, if possible overnight or at least one hour. On our Earth we turn volcanos into instruments of delight. 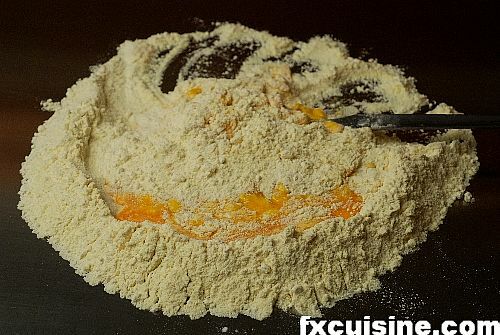 Make a little volcano with about 500gr flour (white flour and a little semolina) and add the eggs. 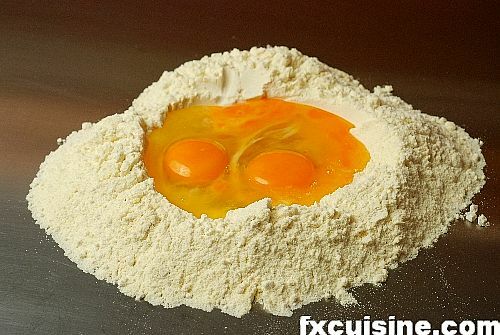 Amalgamate the eggs with the flour. When the eggs do not risk running off the volcano any more, cover with the flour on the sides of the volcano. 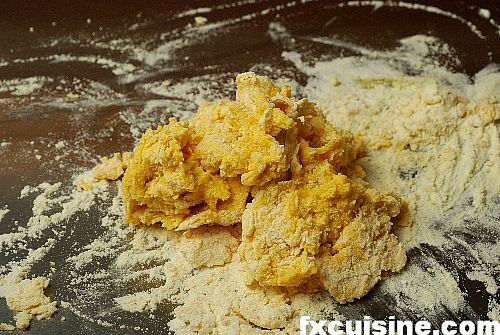 Continue until you start to have a solid mass and add the remaining flour. Avoid using the little lumps that remain on your fingers as these will puncture your dough. Stop when you have a solid, smooth ball. You may have to add a little water (teaspoon by teaspon) or some more flour to get the texture right. 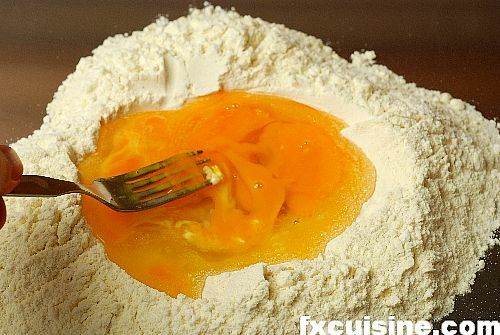 This very much depends on the size of your eggs, but as a rule of thumb one large eggs requires about 100gr of flour. Wrap in foil and leave to rest in the fridge 30 to 60 minutes. Use a large rolling pin to flatten the dough with swift front to back movements. You don't want to squeeze the dough by resting on top your rolling pin like an anvil but rather encourage it to expand by stroking it back and forth. If you push too much you'll break it. 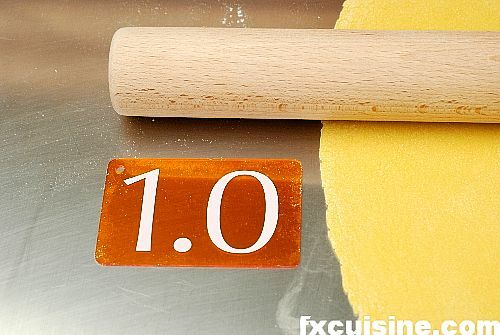 Of course one could use a pasta machine but since you may not have one I show you how to do it with a rolling pin. Continue until the dough is less than 1mm thick. Prepare the filling, a glass and a spoon. 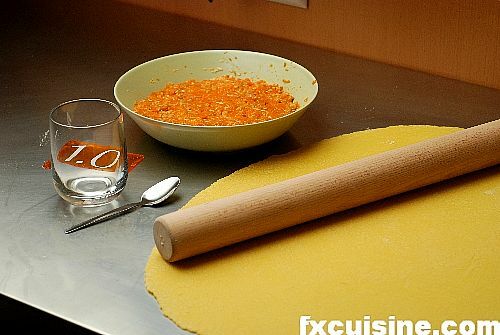 With the glass cut circles from the dough. 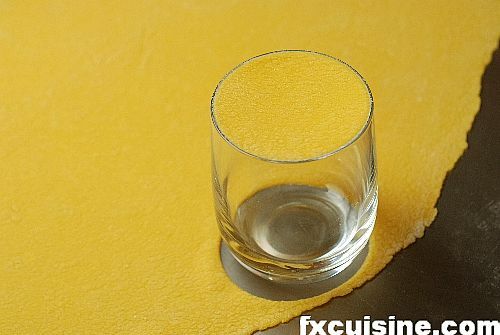 On the picture I cut one out and inverted the glass, you can see the disc of dough covering the glass until you put your finger in it. I wish to stress that my pasta dough is by no means perfect and I would have wanted a smoother and thinner dough, but that's it. 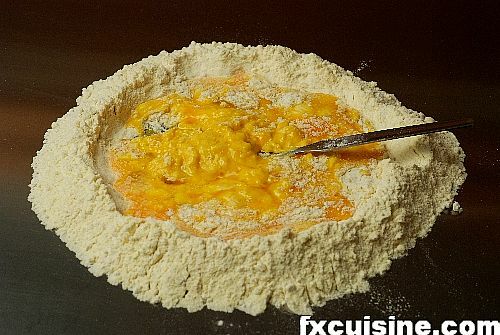 Take a disc of pasta in your hand and add a small spoonful of filling well off center but keeping clear of the edge. Don't try to put too much dough or you'll break the dough and lose the tortellino.